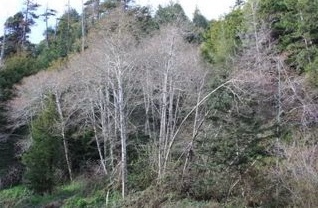 THPBlog: Mendocino Redwood Company to log SW of Leggett, CA. Mendocino Redwood Company to log SW of Leggett, CA. This THP is about 5 miles SW of Leggett, CA, and about 4 miles NE of Rockport, CA on the Mendocino coast at an elevation of 1,200 to 2,000 feet. Mendocino Redwood Company is planning a tractor and cable logging operation on steep and unstable slopes in Douglas fir and redwood forests. The THP area flows into the South Fork of the Eel River which is listed as an impaired watershed for sediment and temperature. There are 11 landslide terrain sites including; multiple debris slides, earth flows, disrupted ground and multiple fill slope and cut bank failures off of existing roads. Mendocino Redwood Company is planning to use ground based equipment on slopes over 50% grade with a high erosion hazard, and use 2 existing tractor roads and several skid roads and landings within a class II (mid sized) watercourse area. They also are planning to construct 250 feet of road on steep slopes over 65% grade in unit 9, and utilize 2 segments of existing roads on slopes over 50% grade. 96 road drainage sites are planned for work including rocking, dip construction, ditch cleaning, culvert repair/replacement and restoration of washed out crossings. In 2017, ten white flowered rein orchids were discovered within units 1 and 2, and glory bush was found along the edge of the plan boundary. There are 3 spotted owl nesting territories within .7 miles of the THP area.